Hokusai-Science day-We used a carousel of activities to show the journey of materials. We mad lava lamps, bath bombs, play dough and played with static electricity. Ringgold Class - Science Day - A visit from the Science Man, creating slime and creating lava lamps. Steve Rossington, a science lecturer from Salford University, came in school to launch our Science day with a literally BANG! He demonstrated to the children the effects that certain gases have on different items, for example he froze apple, banana and flowers all using carb ice (dry ice). He then visited each class for short workshop, when visiting Year 6 he made ice cream, which the children got to eat. He used cream, sugar, milk and carb ice and mixed it altogether which almost instantly it transformed into crystals of ice cream. Banksy class have been learning about light and dark as it is becoming darker earlier, the closer we get to winter! As the children were interested in the puppets in the reading area, we learned about shadows by creating shadow puppet theatres and by blocking the light from the projector so a shadow formed on our interactive whiteboard. This week -13th November- Ringgold Class performed a series of experiments using different substances to see if they would dissolve in water. We used the following: salt, sand, coffee, gravy, chalk, flour and rice. As a result we were able to identify those that were soluble and documented our results. Hokusai searching for mini-beast in their habitats in the school garden. Then looking at and describing different animals and habitats around the world using adjectives. The topic in Michelangelo class this half term is 'How do you use electricity? Solids, liquids and gases are our Science focus for this half term. Yesterday the children began this topic by thinking about the properties of each state and how the particles are structured. Working in small groups, the children role played how the particles of each state of matter might behave. This week Year 4 have been experimenting with various materials to test how effectively they absorb sound. The children conducted the experiment independently using an i-pad for sound and a selection of materials ranging from cloth to bubble wrap. The children thought carefully about how to make it a fair test in terms of what variables could be changed and what must stay the same. Curie class investigating which surface needed the most force to push the car. Lovelace Class visited the Museum in Manchester to bring their recent learning to life. They joined in the various exhibitions and activities, with particular reference to Forces and Robots. They were also lucky enough to see the new exhibit about Space Travel and the artefacts donated by Tim Peake. Lovelace children have been learning about different forces. They designed parachutes and boats to investigate the effects of air and water resistance on objects. In Reception we have been growing cress. We have each kept a cress diary. 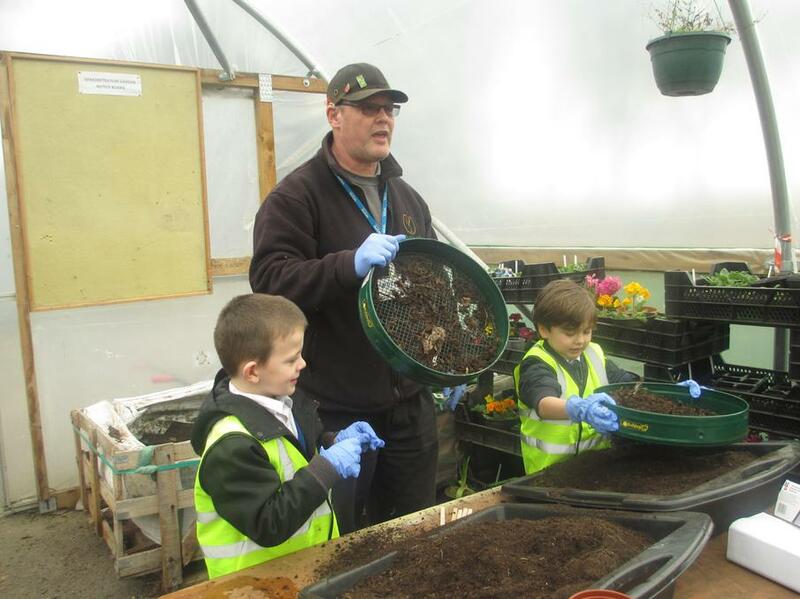 Year 1 Spring 1 - Growth and Green Fingers! We will observe our plants over the half term. Y1 looking for wild plants around school. We made tally charts of our findings. Our focus for this half term is the digestive system and how it works. We began our topic by thinking about our different teeth and how they help the digestion process. This included the importance of looking after our teeth and possible food choices to support this. As you can see, the disclosing tablets were a real hit with the children. We conducted an experiment to see what functions our individual teeth play in the role of digestion. This involved eating an apple and stopping at various stages to think about which teeth we were using at each stage. To examine the digestion process in detail, the children conducted an experiment to replicate each stage. This involved using a plastic bag to represent the stomach, orange juice to represent stomach acid and various other items to replicate each step of the process. It was a practical, fun filled experiment which the children learnt a lot from. Einstein's topic for this term is electricity. Over the coming weeks the children will consider how electricity is used and create their own circuits with varying components. We will link electricity to our English and Design Technology lessons too, by using electricity themed comprehensions and designing an electrical object of our own. In Einstein class this half term we have completed so many science activities! We are now amazing at making circuits, talking about circuits, adding buzzers and motors into our circuits and even building Lego houses that include circuits! We have answered lots of scientific 'SATs style questions' that link to our learning, we have completed many practical experiments, we have evaluated our learning and even created an assessment poster of all the wonderful things we now know! We were also lucky enough to have a visit from 'Creative Builders Workshop' whereby we took part in a Lego workshop; we built Lego houses that included circuits that lit up. We had so much fun and worked amazingly hard as a team. We all shared the Lego, supported each other and praised each other for our wonderful work! We hope you enjoy looking through our work from Autumn 1. Lego Workshop - Our Circuit Work! Today we took part in a Lego workshop. We built our own Lego city which included a working circuit. We worked so well as part of a team and we even got to make a car move. We put into practice all the wonderful things we have learnt in science this half term. We really enjoyed it! This half term Year 6 have been doing research about evolution. Here are a couple of pictures of us at work! Year 2 - Growth and green fingers. We visited the community garden at the Memorial Park and planted our own sweetcorn! We can't wait to go back and harvest it in the Autumn.